Ko is a Japanese go term adopted into English usage. It describes a situation where two alternating single stone captures would repeat the original board position. The alternating captures could repeat indefinitely, preventing the game from ending. The ko rule resolves the situation. The term “ko” is also used more generally in reference to other repeating patterns and rules involving them, although “superko” is the general term for repetitions other than the take-and-take-back ko, which is sometimes called “basic ko” to distinguish it from them. For the position shown on the left in the diagram, Black can capture the stone by a play at a. The resulting position is shown on the right. 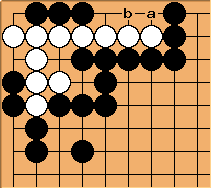 Without a ko rule, in this position White could recapture the stone at b, reverting to the position shown on the left, and then Black could also recapture. If neither player gave way, then we would have Black a, White b, Black a, White b, ..., repeated ad infinitum, stalling the progress of the game. This situation is known as ko. If one player captures the ko, the opponent is prohibited from recapturing the ko immediately. So, if in left position of the diagram above Black captures at a, White may not play at the marked point during his first move after the black capture. Instead White has to play elsewhere. After that Black can choose either to win the ko by playing at b in the right position in the diagram, or to play elsewhere as well. Playing elsewhere however would allow White to take the ko back, since the recapture restriction is only valid for the next turn..
Kos need not occur only in the center of the board. They can also show up at the sides or corners of the board, as shown in the diagram below. Note that a capture-and-recapture position is only ko if there is one stone captured and one stone recaptured. If Black captures at a in one of the situations above, White is allowed to retake at the position of the marked stone. This does not cause any infinite loops, and is not disallowed by the ko rule. This situation is known as capture two, recapture one. In the diagram above the value of capturing the ko is limited. However, situations exist where the value of winning the ko is much bigger. Two general cases are discussed here: Ko in life and death; and connect or cut. In this diagram the life of the white group depends on who wins the ko. If black wins the ko by filling at a, black forms a dead shape and the white group cannot make two eyes. If white has captured at a, white can win the ko by capturing at b. The white group would then be alive. The difference between winning and losing this ko amounts to 22 points. In this diagram the marked white stones are at stake. They can be saved by connecting to the outside group. However, to do that white must win the ko, by first capturing at a and then filling at . 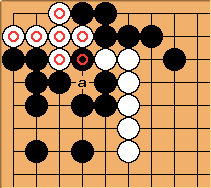 Black can win the ko by filling at a, in that case the white marked stones are cut off and dead. The difference between winning and losing the ko amounts to 15 points. The above two situations show that it can be a considerable disadvantage to not be allowed to capture back a ko. Consider that you are black in the connect and cut example. After white has taken the ko at a you are not allowed to capture back and must play elsewhere. It is possible for you to take some big point elsewhere on the board. White will fill up and you can play another big point elsewhere on the board. That way black gets compensation for not winning the ko by getting two moves elsewhere. Another way for black is to attempt to win the ko by playing a ko threat. In this diagram black can play at a. White must respond at b. If white neglects to respond black will kill all the white stones by playing at b himself. After white has responded black can return to the situation in the previous diagram and recapture the ko. After that white is not allowed to recapture and white can look for a ko threat themselves. This process is called a ko fight. The ko situation as it is defined above is the most common cycle that occurs in go. However, more complex cycles exist, eg. triple ko and eternal life. More examples can be found on the cycle page. Complex cycles occur in games only rarely. The (basic) ko rule as described above does not resolve all kinds of cycles. In some cases, the occurrence of a complex cycle has led to the game being ruled no result. In order to avoid such rulings several generalized ko-rules have been developed, eg. superko and the Ing ko rule. Most ko rules restrict repetition(s) of previous board positions. Despite this simple objective, designing a formal definition that satisfactory deals with all cycles without unintended effects elsewhere is notoriously difficult. This is reflected in the fact that many indepth discussions, e.g. /discussion, have taken place on senseis library. An overview of ko rules can be found here. ... or pass, which would only happen at the end of the game, when no interesting moves are available. Winning the ko usually means a loss elsewhere on the board. That is called the ko exchange. Note that you do not need 22 points of compensation for this ko. By miai counting, black has 7 2/3 points here, and a play in the ko is worth 7 1/3 points. If your two moves elsewhere gain 15 points together, you can gain by letting the opponent win the ko.